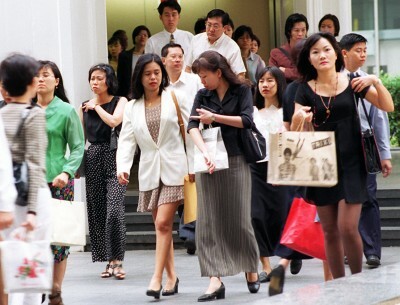 SOME Singapore companies are positive about employment prospects in the future even though concerns about rising costs and global economic uncertainties have pulled business sentiment down. Three of the 10 Singapore companies polled in the Thomson Reuters/Insead Asia Business Sentiment Survey indicated that they were positive about increasing hiring in the next six months. One of these Singapore companies was from the property sector here, even though all three Singapore property companies surveyed reflected a neutral stance on business sentiment. A Singapore company from the airline sector also indicated that it was positive about increasing employment opportunities despite its negative outlook on the future. The third Singapore company upbeat about its hiring in the future comes from the resources sector, said Matt Driskill, senior editor in charge of the survey for Thomson Reuters. Even though companies surveyed from the shipping sector were generally neutral on business sentiment, with one of them indicating a positive outlook, there was one that reflected a negative view on its hiring for the coming six months. Firms in the shipping sector in Singapore were also negative about orders and sales in the same period with firms in the financial sector, and three companies in the resources and property sectors stating a neutral stance on this. Generally, however, firms in the food and property sectors were positive about orders and sales in the next six months. Broadly, companies polled in Singapore were still more concerned about the global economic uncertainties than other risks. Out of the 10 companies in the survey, eight indicated that this was their biggest concern while the other two placed rising costs at the top of their lists of perceived risks. Overall, airlines was the most pessimistic sector across the Asia-Pacific region, according to the survey. Global economic uncertainty that hurt travel mostly to and from the eurozone has eaten into airlines' margins in recent quarters as high fuel prices and regulatory uncertainty remain concerns for Asia-Pacific carriers. Property companies saw a fall in sentiment during the fourth quarter and were mostly neutral. These companies had seen significant improvement in business sentiment in the third quarter, when five of 10 surveyed responded with a positive view and the others with a neutral view. One company cited regulatory uncertainty as the biggest risk in the fourth quarter. Financial companies were mostly neutral with all but one of the 18 respondents across the region saying that global economic uncertainty may hurt their businesses going forward. Asia-Pacific companies from the food, resources, retail and shipping sectors were more bullish about prospects in the coming half year compared to others. Food and drinks companies were the most bullish with an index reading of 77 for the quarter, an improvement on the last quarter's 73. Higher costs were a concern, and commodity price volatility and changes in consumption trends also posed a risk. An overwhelming eight respondents said new orders were likely to increase. Half of the 14 resources firms were positive on their outlook, and most of them expected customer payments to remain stable. Three participants said rising costs was the biggest risk they faced, while most others worried about global economic health. Seven participants saw no change in new orders. Retail companies showed strong improvements in sentiment in the fourth quarter, with four participants saying they were positive, while the rest were neutral. Rising costs and the health of the global economy were cited as the main risks to the outlook by retailers. Sentiment for shipping companies improved, with none of the six companies polled being bearish. None of them said they were worried about rising costs or foreign exchange volatility, and most of them expected customer payments to remain the same. This was in contrast to the mixed responses from shipping companies in the previous quarter, when one company held a positive view, one neutral, and a third negative.